Most men in their 30s are suffering from thinning hair in front or hair loss, it’s actually unavoidable. It’s alarming to know that more or less 60 percent of the guys at the age of 35 experiencing hair loss and eventually it could lead to partial baldness. Well, hair loss and baldness are genetics, it’s common for us to think that we get it from our fathers but we are not very aware that genes from our mothers are the reason as well. There are medications to delay hair loss, your diet is also helpful to slow it down. It’s important to choose your cut and hairstyle well. You don’t want to highlight your bald spot, you must be careful with styling your hair. There are many ways to cover up your hair loss while still looking fine. There are plenty of hairstyles to choose from, some of the styles are classic which never go out of style and some are trendy in these past years. Having the right style and cut of your hair can help you be confident over your crown problem. Here are 7 hairstyles for men with thinning hair in the front area of the head. This cut works like an illusion. It’s favorable for men with thinning hair on the front of the head, it makes the top look fuller with the sides shaved. 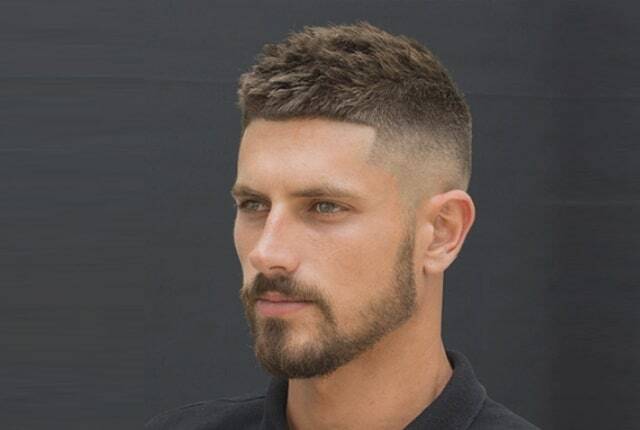 Receding hairline seems less obvious with this cut, it appears like you have an even hairline because the temples and the sides of the head get lesser contrast in between. It is neat and does not need to do a lot of styling. If you want to add more volume texture, you can use some hair product to groom it well. For the people who are not fans of short hair, then this hairstyle popularized by The Beatles is perfect for you. It is ideal to cover up the thinning of the front hair for men. Also mop top perfectly hides the receding hairline by brushing the hair forward and it leaves you your fringe on the forehead. Mop top works well with straight or wavy hair. Use pomade, hair mousse or leave-in conditioner to style your mop top. To add more volume to the hair, use a hair dryer with the hair mousse, don’t use for too long because it would just make the hair go up instead of hanging down. For wavy or frizzy hair, it usually difficult to make it hang down. Use a hair straightener iron to style it. Well, a receding hairline is not good but you can show it off confidently with the slick back hairstyle. It works perfectly with the men’s thinning front hair, it adds flattering volume to the top of the head. You can opt to comb hair straight backward or slick it across to style it up. If your hair is really thinning, the buzz cut is the easiest to pull off, it just requires very small effort. Little patches on your head would not be noticeable since the scalp is visible and the hair is really short. It’s also a good option if you have a receding hairline. It doesn’t make the hairline look so visible. The contrast between the hair and the forehead is lighter. One length all over your head is the recommended buzz cut for men’s thinning hair in front. Your thinning hair in front and a receding hairline is not that hard to style hair with this problem. Taper faded sides hairstyle is perfect for you, it’s classic and stylish. This hairstyle is versatile and timeless, hair at the top is longer and slimmer on the sides, making the top hair seem fuller. It’s safe to style up, you can adjust the cuts or volume of your hair depending on your face shape. Style it up to add texture and volume with a blow dryer. Use little wax or pomade, use your fingertips to apply the hair product and tousle your top hair to create more texture. This cut is longer than a buzz cut but not very lengthy. It’s is just an inch long all over, this is ideal for receding hairline, style it up like messy especially on the area of your temples. A little longer hair can be styled whatever you want and also it seems to have more volume. Use hair products your comfortable using to style it. When your scalp can be seen easily because it became visible at the top of your head, the spiky style will help you to cover it up. This style makes the texture of the hair thicker that lessen the appearance of the problem, that is hair thinning. Spikes style is classic and it is a flattering choice for men with thinning front hair. This style can make you look younger. You can have this style better with short hair at the back and long at the front.